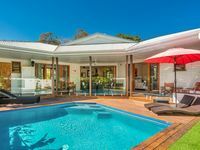 Properties in Byron Bay average 4.6 out of 5 stars. Property 11: Billen by the Beach. Property 19: Half Moon Cottage - Right across from Belongil Beach! A Perfect Stay – Jimmy's Beach House - 50m walk to the beach! Property 34: A Perfect Stay – Jimmy's Beach House - 50m walk to the beach! A Perfect Stay – Sweethaven - Belongil at it's best! Property 48: A Perfect Stay – Sweethaven - Belongil at it's best! We are a family of 6 - we had a great week at Elevation. We do hope to return again. The house and pool were very lovely. Pool was warm and very private. The owners were helpful and friendly.